The following terms and conditions apply to all competitions organized by the Promoter, including telephone, flyers, mobile services or online on the www.waterfrontmagazines.co.uk website or any other competitions. (Please see end of these terms and conditions for details of the Promoter). These general terms and conditions should be read alongside, and are in addition to any specific terms which may be mentioned at point of interaction, in any promotion of or messages about that competition. This includes without limitation information given through flyers, online or mobile. If you do not agree with any of the terms and conditions then you should not take part in the competition. The terms and conditions may be amended at any time without prior notice. 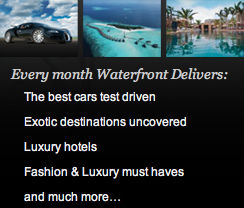 Any changes will be posted on the waterfrontmagazines.co.uk website. It is your responsibility to ensure you review the terms and conditions regularly to familiarise yourself with any changes. We recommend that you print and store or save a copy of these terms and conditions for future reference. The following general terms and conditions apply to all competitions promoted by the relevant Promoter. 1.1. Entrants must meet the eligibility requirements as specified in the terms and conditions. Failure to meet the eligibility requirements may result in an entry being invalid and/or forfeiture of any prize. 1.2. The competition is open to residents of the United Kingdom and the Channel Islands aged 18 years or over at the time of entering the competition, unless specified otherwise. The competition winner must provide a UK or Channel Islands address for delivery of the prize, and the Promoter will not deliver to any address outside the UK or Channel Islands. 1.3. Employees and members of their immediate families (including any live-in partner) of the Promoter, the provider of the prize or any person connected with the administration or otherwise of the competition and/or prize where applicable, are ineligible to enter. Any such entries are invalid. 1.4. The Promoter reserves the right in its sole discretion to ask for evidence to verify the age, identity and/or eligibility of an entrant at any time and to use any channels and methods available to carry out checks of any details provided. The Promoter may withhold delivery of the prize until it has received such evidence and failure to provide such evidence may result in forfeiture of the prize. 2.1. The opening and closing date and time for entries is as indicated in the interaction information. Any entries received before or after these times will be discounted and will still be charged. 2.2. In order to enter the competition, entrants must answer the question or complete the task and provide the information as indicated in the interaction information. Entrants may be required to provide their full name, full contact telephone number (including area code) or other method of contact (if applicable), email address and any other information as specified at the time of entering the competition. The Promoter will not be able to amend such information once entry to the competition has been made. 2.3. Each entrant will be charged the cost of entry as indicated in the interaction information whether their entry to the competition is successful or not. Entrants must have the permission of the bill payer before entering the competition. The cost of entry and any entry delivery costs as indicated in these general terms and conditions or in the interaction information includes taxes. 2.4. Waterfront Magazines Ltd cannot guarantee that entries made from outside the UK and Channel Islands will be entered into the competition and charges will depend on the relevant service provider’s international rates. If an entrant enters the competition from outside the United Kingdom and Channel Islands, they must still meet any applicable eligibility criteria. There is no warranty that the service is available, legal or appropriate for use in locations outside the UK. 2.6. SMS entry: SMS entrants should send an SMS to the shortcode as indicated in the interaction information. The charge per SMS will be the cost indicated in the interaction information plus any applicable standard network charges. The total cost will therefore be dependent on the entrant’s network. Charges will be deducted from the entrant’s available credit time if they are a pre-pay customer or appear on their monthly statement if they are a pay-monthly customer. SMS entrants will receive an SMS confirming their entry, which may include information about its sponsor or other services relating to the competition. SMS entrants may opt out of receiving any additional marketing messages by texting STOP to the shortcode indicated in the interaction information. 2.7. In the event of any fault, mistake, misunderstanding or dispute concerning the correctness or acceptability of any answers given by entrants, or the operation of any part of the competition, network or phone system, the decision of the Promoter shall be final. 3.1. The prize is as specified in the interaction information. Unless otherwise stated in the interaction information only one prize per person is permissible. 3.2. The prize is subject to availability and to winner confirmation, i.e. the Promoter has managed to contact the winner and received confirmation of eligibility. The prize is also subject to the terms and conditions of the prize provider, their agents, and where applicable to the terms of the venue and/or the manufacturer. 3.3. Where the prize relates to travel and/or accommodation, the prize will be subject to availability and certain dates may be excluded when the winner may not take up the prize. All elements relating to such prize must be taken up during one period, and not on non-consecutive dates. The winner (and their companion(s) if applicable) will be required to hold a valid passport and/or other necessary travel documentation, authorization and visas. Where the prize relates to travel for more than one person, the winner and their companion(s) must travel together, departing from and returning to the same location at the same time and on the same itinerary. The prize provider and/or their agents cannot guarantee that seats will be adjacent to each other. 3.4. Where the prize necessitates travel and/or attending an event on a specific date, the winner must be available on the date(s) specified by the Promoter in the interaction information and no alternative dates will be available. Where the prize involves travel or accommodation on a date and/or to a destination to be chosen by the winner, the date and/or destination chosen is subject to availability and the Promoter reserves the right to determine a final date by which the prize must be taken. 3.5. Where the prize includes a cheque, voucher or giftcard, such prize will be made payable in pounds sterling in the name of the winning entrant only and such cheque, voucher, or giftcard cannot be made payable to any third party. No other form of payment than indicated in the interaction information will be made. 3.6. The Promoter, prize provider, the issuer of the vouchers or giftcards and their agents reserve the right to refuse to accept vouchers and/or giftcards which are deemed to have been tampered with, defaced, duplicated, damaged or which otherwise are suspected to be affected by fraud. 3.7. Where the prize and/or information relating to the prize is to be provided directly to the winner by a third party, the winner (and where applicable, their companion(s)) is (are) required to comply with all instructions and necessary requirements as may be specified by the third party to receive and/or take up the prize, including but not limited to contacting such third party within specified time frames, adhering to the itinerary as specified, paying any required charges and/or costs which are not included in the prize, completing any required forms including but not limited to booking forms and to delivering any required documentation to that third party, including but not limited to proof of identification. The Promoter will accept no responsibility and will not be liable to the winner or any other persons where the winner fails to comply with such instructions and such failure may result in forfeiture of the prize. 3.8. The winner (and where applicable, their companion(s)) may be required to provide their signature as proof of their agreement to relevant waivers, releases and/or consents when taking up the prize. Failure to sign any relevant documentation may result in forfeiture of the prize. 3.9. The prize excludes all other costs and arrangements not expressly included in the prize (as stated in the interaction information). Additional charges and expenses incurred for goods, services, attractions, facilities, upgrades, activities and events not expressly included in the prize are payable solely by the winner (and where applicable their companion(s)). The Promoter will not be held liable where such charges and/or expenses are incurred, and no refund or reimbursement will be made. The Promoter will accept no responsibility where the winner is unable to pay in full, any such charges and/or expenses as incurred. 3.10. For delivery of the prize, we may ask you to be available at a specified time and place. 3.11. No cash equivalent (where applicable) or alternative prize will be given at the request of the winner and the prize is non-transferable and non-exchangeable. However, the Promoter reserves the right to change the prize due to circumstances beyond its control or if any part of the prize otherwise becomes unavailable, and/or to offer an alternative prize. If for any reason the winner chooses not to take up the prize or any part of the prize, the Promoter reserves the right to ask the winner to confirm this in writing and the Promoter will be able to retain or dispose of the prize at its own discretion. 3.12. The Promoter may refuse to provide a prize, or seek its recovery, in the event of non-entitlement under the interaction terms and conditions or an entrant’s breach of the interaction terms and conditions, fraud or dishonesty, including but not limited to the use of technology which enables an entrant to evade applicable charges when entering the competition. 3.13. The Promoter or prize provider(s) endeavour to deliver the prize to the winner within twenty eight (28) days from the date of winner confirmation unless stated otherwise in the interaction information, with the exception that where the prize is time critical the Promoter or the prize provider(s) endeavour to deliver the prize to the winner as soon as reasonably practicable before the necessary time to take up the prize. The Promoter, prize provider and their agents will not be liable where a prize has been lost or stolen following delivery and such prize will not be replaced. 4.1. Where the winner is randomly selected, the prize draw for the winner will take place on the date indicated in the interaction information. Unless stated otherwise in the interaction information, the winner will be the first correct entry drawn at random from all entries, subject to eligibility and winner confirmation. Where the winner is not randomly selected, the interaction information will detail any criteria for judging entries. 4.2. The winner will be contacted as soon as practicable on or after the draw date as indicated in the interaction information. Reasonable efforts will be made to contact a winner on the phone number provided when entering the competition or such other method of contact deemed appropriate by the Promoter in its sole discretion in the circumstances. Where the prize is time critical and a winner needs to be found before the time to take up the prize passes, the announcement on air or the interaction information will indicate the date when the winner will be contacted and the Promoter will contact such winner on the phone number (or other method of contact (if appropriate)) they provided, calling three times in a two-hour daytime period or as indicated in the interaction information. If the winner cannot be contacted or successful contact is not made within the fixed time period as specified or if they fail to provide an address for delivery of the prize or fail to meet any of the eligibility requirements or are otherwise unable to comply with the interaction terms and conditions, this may result in forfeiture of the prize and the Promoter reserves the right to disqualify that entrant (without further liability to that entrant) and offer the prize to the next eligible entrant and thereafter until a winner is found. 4.3. Any entrant and/or winner must comply with any directions given to him or her by the Promoter, prize provider(s) and/or their agents and with all relevant laws, rules and regulations, restrictions, itinerary. Failure to comply with instructions, itineraries, rules, restrictions, requirements, laws and guidelines may result in an invalid entry and/or forfeiture of the prize. 6.1 Nothing in the interaction terms and conditions restricts your statutory rights as a consumer. For more details on these statutory rights you should contact your local Trading Standards Office or Citizen’s Advice Bureau. 6.2 Nothing in the interaction terms and conditions shall exclude or limit the Promoter’s liability for death or personal injury caused by their staff or supplier’s negligence or for fraud. 6.3 Subject to 6.1 and 6.2, the Promoter does not accept responsibility for any fault, malfunction, damage, loss or disappointment suffered by you as an entrant or participant howsoever arising from participating in a competition or from accepting any prize whether due to any error, omission or other cause by the Promoter. 6.4 Subject to 6.1 and 6.2, the Promoter is not responsible for any damage or loss caused to you (i) which is not reasonably foreseeable to the Promoter when you agree to the interaction terms and conditions (which occurs automatically when you enter a competition) or (ii) is reasonably foreseeable to you and to the Promoter when you agree to the interaction terms and conditions but is only indirectly related to you entering or participating in a competition. 6.5 Subject to 6.1 and 6.2, the Promoter reserves the right to amend any element of a competition or prize for reasons beyond their reasonable control, including but not limited to the unavailability of the competition entry platform before the closing date, or for strike, lock-out, labour dispute, illness, act of God, natural disaster, adverse weather conditions, war, riot, civil commotion, accident, epidemic or pandemic, malicious damage, fire, flood and/or storm, compliance with law or governmental order, rule, regulation or direction, breakdown of plant, machinery or transportation. The Promoter is not responsible for any loss or damage caused to you as a result of any of these occurrences. 6.6 Subject to 6.1 and 6.2, the Promoter cannot promise that the services relating to the competition will be free from errors or omissions nor that they will be available uninterrupted and in a fully operating condition. These services may be suspended temporarily and without notice in the case of any problem with any telephone network or line, system, server, software, or for any technical malfunction or failure, maintenance or repair or for reasons reasonably beyond the control of the Promoter. The Promoter will not be liable to you or to any other person in the event that any entry is lost or not properly received, registered or recorded or where all or any part of the service relating to a competition is discontinued, modified or changed in any way. 6.7 You agree to reimburse the Promoter in respect of any damages suffered by the Promoter or any losses by the Promoter resulting from any claim made by a third party in each case in respect of any matter arising from your use of the services relating to the competition in breach of the interaction terms and conditions or from your violation of any applicable law or regulation. 6.8 Subject to 6.1 and 6.2, the Promoter will not be liable to reimburse the cost or expenses incurred in making a competition entry where applicable. 6.9 Subject to 6.1 and 6.2, the Promoter does not accept responsibility for any incorrectly addressed or undelivered competition entries or for any disruption, delay or misdirection of such entries. 7.1 Information and data (“personal data”) which is provided by you when you enter a competition will be held and used by the Promoter and their service providers, network operators, suppliers and contractors in order to administer and fulfill the competition, prize and in connection with payments for entry to the competition. 7.2 The Promoters will only pass your data to third parties for marketing purposes if you have accepted to receive marketing information from those third parties. 7.3 If you are entering a competition by SMS, we may send you marketing communications in respect of similar products and services. You may opt out of receiving any marketing communications from the Promoter by SMS by adding the word STOP after the keyword or SMS entry number as specified in the interaction information. 7.5 The Promoter and/or the prize provider may be required to send personal data of the winner of a competition (and where applicable, their companion(s)) to third parties outside the United Kingdom, for the purposes of fulfilling and administering the competition and/or the prize and the competition winner agrees to such transfer for these purposes. 7.6 The winner of a competition may be required to participate in publicity. The Promoter (or any third party nominated by the Promoter) may exercise its sole discretion to use the competition winner’s (and if applicable their companion’s) name and image and their comments relating to the prize and competition experience for future promotional, marketing and publicity purposes in any media worldwide without notice and without any fee being paid. 7.7 Please note that calls may be recorded to ensure that competition entries are captured, for staff training and/or quality control purposes. 8.1 Please note that when you pay for a competition entry, any rights you may have to withdraw from or cancel your purchase (including but not limited to under the Consumer Protection (Distance Selling) Regulations 2000) will be lost because the performance of our services is simultaneous or begins immediately once your purchase is completed. 9.1 You agree that you do not have any commercial relationship with the Promoter and that you are not an agent of the Promoter. 10.1 The interaction terms and conditions are available in English only and shall be exclusively governed by and construed in accordance with the laws of England. Any disputes to these terms and conditions will be decided solely in the English Courts. If any of the terms and conditions are held by any court of competent authority to be unlawful, invalid or unenforceable, in whole or in part, this will not affect the validity of the remaining terms and conditions which will continue to be valid and enforceable to the fullest extent permitted by law. 11.1 These terms and conditions were last updated on 13 September 2011.